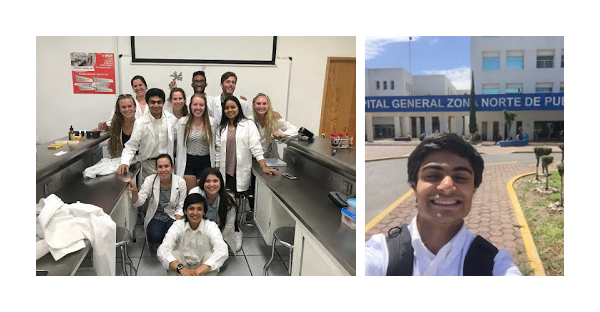 Wagle with his university medical class (left) and at El Hospital General Al Norte in Puebla, Mexico (right). Studying abroad for the first time was an extremely nerve-wracking, yet exciting experience that I will never forget. As soon as I entered my terminal and saw my friends, I knew that this study abroad experience would be truly special. During the plane rides, I kept thinking about how all of the Spanish classes that I had taken and all of the times that I had practiced speaking in Spanish had finally come to this. In the end, it was simply incredible to have the opportunity to become fully immersed in a different culture and to be able to navigate through the city of Puebla using the Spanish speaking skills that I had previously acquired.